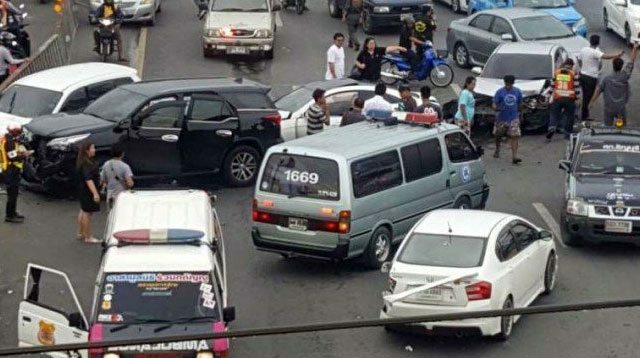 Last Saturday, May 6, a woman in Bangkok, Thailand drove a brand new Toyota Fortuner and chased a white Mercedes Benz being driven by her husband, who happened to have his mistress in the car with him. The Toyota Fortuner ended up crashing into the Mercedes Benz and damaging three other vehicles. "The pile-up occurred at around 4:30 p.m. on the Rangsit-Nakhon Nayok Road in Tambon Bung Yitow in Pathum Thani's Thanyaburi district. It caused a severe four-kilometer-long traffic jam before the scene was cleared," reports Asia News Network. The report further revealed that "the woman had traced her husband using GPS." Then, when she caught up with his Mercedes Benz, she decided to crash her vehicle into his "to stop him from getting way."